Usually when I’m out on a run I’m thinking mostly about trying to maintain my pace, which road I need to turn down next, and any homework I have due. Unfortunately for me, when this thinking process is taking place I somehow manage to forget to do other important things such as you know breathing, but I usually manage to keep it together pretty good. I decided that the next time I went out for a run, I would completely clear my mind from all my thoughts, and just observe what is ‘nature’. I noticed that while I was running there was this large bush, which I almost thought it out to be a small tree. Of course it wasn’t until later that I found out it actually was a shrub. 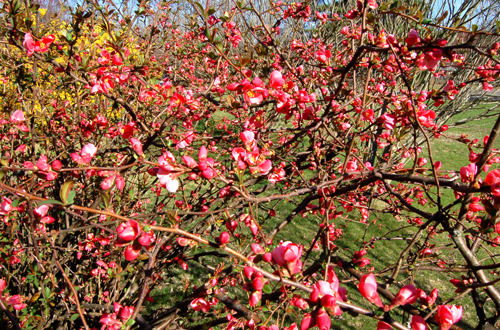 It was called a ‘Quince shrub’. The reason I noticed this particular shrub was mainly from all of the bright pink flowers it had blooming. As I got closer and examined it more clearly, I heard loud buzzing noises so my initial reaction was to just keep running! But as I backed away I also saw some hummingbirds at the top circling it. It was very interesting and of course naturally the process taking place right before my eyes was ‘pollination’. To see a small part of pollination occurring was definitely cool and it got me thinking about how each organism in nature relies on one another to survive. For example, if the Quince shrub did not produce any flowers, then the birds and the bees would not be able to survive since they rely on the nectar. However, if the birds and bees did not fetch for the nectar and pick up pollen at the same time to disperse it as they fly to different plants, the flowers in question would not exist. Overall, pollination and the relying of organisms to one another is an ongoing process that will definitely continue for years and years to come. I appreciate the way in which you thought about the interworkings of different organisms in a certain ecosystem. You also incorporated some of your thoughts and personality into the post which made it more interesting to read. Some posts are dull due to their impersonalization, but yours was fun to read while remaining informational. I’m wondering if clearing your mind of homework and taking in the beautiful landscape around you helped with your running. Did you remember to breathe? We have a Quince bush in our front yard and it’s beautiful. In the Fall it produces a fruit(Quince), which This Old House says is edible (for humans). I have not gathered up enough courage to try them. Very good is it possible that you could add some links you recommend on pollination and information about the Quince Bush. Would the humming birds really die off or would they just find a different source of pollen?